If you’re a business owner in need of experienced and reliable Deptford commercial electrical contractors, D.P. Murt Inc. should be your choice. D.P. Murt is based in nearby Pennsauken and offers full service electrical and wiring services to businesses throughout South Jersey. We are a veteran-owned business and have been serving the area responsibly for over 30 years. Our clients know that we’ll complete the job on time and on budget. Commercial Services. If you need to replace a less dependable wiring system in your office, retail shop or restaurant, D.P. Murt will replace it with a new and code-approved system. We can help you design and build your new systems, save you on future expenses with energy conservation audits, and install new lighting and telecommunications. If need be, we can install an entirely new power generator. Industrial Services. 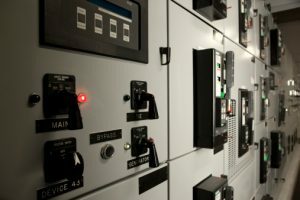 Our expert technicians will keep your plant going with electrical system installation and/or maintenance that will help prevent expensive shutdowns. D.P. Murt installs and services generators, power wiring and most types of circuits, including installing UPS and emergency systems when acts of nature strike the area. We can also help keep your employees and plant safe with security and fire system wiring upgrades. Institutional Services. D.P. Murt can install a new, energy-efficient lighting system to replace your existing one; if needed we offer a free lighting survey to see if a new system is worth your while. D.P. Murt services include installation of solar technology that reduces pollution. Click on our Services tab to learn more about the services we offer to businesses in need of Deptford commercial electrical contractors. Whether you’d like to improve the efficiency of your electrical systems or install an entirely new one, click here for a free survey to get started. D.P. Murt is ready with the knowledge and solid experience to keep your business running.